Google Docs has been growing in popularity of late. It has been eating into the share of Microsoft in the office documentation market. The usability and portability that Google Docs provide was something that users had wished for. So how can Microsoft just sit and look. 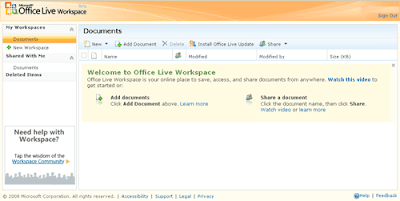 It also has its online Document and spreadsheet sharing service known as Office Live Workspace. As a first look it may seem that it is as functional as Google Docs but actually it is not. It is more of an online sharing platform rather than an editing tool for Docs and spreadsheets. >> Now you can select the desired Profile of your workspace - Either Office Live workspace or Office Live Small Business. 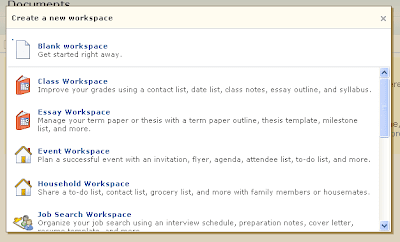 >> After logging into the workspace you can see the Interface as shown here. >> Select a new workspace from the Left Hand Side menu. It gives you a list of default workspace templates from which you may choose or a blank workspace. Try those out, and get in your reviews. As I Mentioned it is not as functional as Google Docs, like you can upload a word document to it for sharing, but you can only view it and not edit it. But you can surely make notes on workspace. Also you can create datasheets and later export it to excel sheets. In order to make your offline Office Applications to work with Live Workspaces you will need to download Live Signin Assistant. Here is the Detailed Documentation. will small business workspace better for me ??? You can try it out. They give you a subdomain for free and you can also register a domain with them, which gives you one year free.